On the weekend I went to see a movie – a rare occurrence for me! 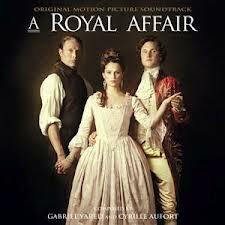 This superb piece of theatrical eye-candy was A Royal Affair. The story is based on the life of Caroline Matilda (1751-1775), a member of the British Royal Family, who married the King of Denmark, Christian VII, in 1766. The marriage was, unfortunately, an unhappy one, with the King rejecting his new wife soon after their marriage in favour of various courtesans. He was also mentally unstable, which made his behaviour irregular and difficult to tolerate. Nevertheless, in 1768 Caroline bore him a son, Prince Frederick, who would later inherit the throne. After an extended period of travel during 1768-9, the King returned to Copenhagen with a new German physician, Doctor Johann Struensse. He was a believer in the Enlightenment that was currently spreading through Europe, and brought his new ideas to a very conservative Denmark. Struensse used his influence over the King to bring about various reforms to the country, which culminated with the King dissolving the Council and installing Struensse as a Privy Councillor. In this role, the Doctor brought about numerous changes to the country in the interests of moving Denmark “forward” to be in line with the rest of Europe. 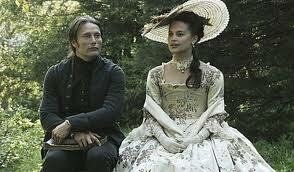 By 1770, Struensse and Caroline were having an affair. In 1771, Caroline bore her second child, Louise Augusta. Whilst she was most probably the child of Struensse, she was considered a Princess of Denmark throughout her life. 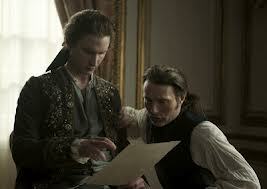 Once the affair became open knowledge, the King signed an arrest warrant for both Struensse and Caroline. Caroline was imprisoned, divorced and then deported, and Struensse was executed for treason. Caroline never saw her children again, and died of scarlet fever at aged 23. With the absence of Struensse, the King was declared unable to rule and his step-mother and her son (also a Prince Frederick) installed a Regency, reversing the changes that Struensse had made. Interestingly, Caroline’s son took back the throne in 1784 in a coup and became the new Regent until the King’s death in 1808. During this time, he was successful in introducing a wide range of liberal reforms characterised by the Enlightenment period. The movie was subtitled, as it was spoken in Danish, but this just added to its charm. From what I can discover, the movie is quite historically accurate, although the characterisation of Struensse as idealistic rather than ambitious could be considered contentious. Aside from the fact that true stories NEVER have happy endings, I really enjoyed it! The costumes were divine, and the photography was fantastic as well. Period movies are my cup of tea! Yes! My husband and I have probably now watched every period film out there, and we have a little library of dvd’s of our own that we love to watch over and over, curled up with tea in our 1678 bed with a fire going in the bedroom! You sound like a definite kindred spirit! I am beginning to very purposefully expand my collection of period films. I never thought it would cause me so much satisfaction to do so! And I am intrigued by the 1678 bed! That would be amazing to sleep in every night, especially with an open fire!